Time is a funny thing. When you're paying attention, it moves slowly. But when you're not paying attention, right by it flies. The last seven months that I have spent away from World of Warcraft didn't seem like a big deal. It feels like just yesterday that I was logged in, assaulting the battlegrounds, sending Garrison followers on missions, screaming at the screen during a Highmaul pick-up raid, and damning various world bosses for the chance at mounts and glory. But it has indeed been a big deal, and seven months is plenty of time for change to happen. Since March, Warcraft has seen a major patch released that included a new zone as well as the final raid of the expansion. Many players have received their legendary rings, and improved their item levels beyond the 700 barrier. There have been new items and new features - far too many to list here. But the most important change in these last seven months doesn't include them, or the zones or the raids and rings. In my experience it is that everything that has happened in-game was happening in a context of consistently-dropping subscription numbers. Player numbers have continued to fall month after month, and life on the perimeter of WoW has looked bleak to those of us peering in from the outside, wondering if it was time to revisit the world our avatars called home for over a decade. Server traffic was decreasing, player achievements were dropping (per MMO-Champion) and friends and guild members were few and far between. Seven months was the longest break that I had ever taken from the game since launch, and my hope for a WoW revolution was beginning to dim. Nothing in the WoW universe is more important to the Warcraft story than the Burning Legion. Not the Horde. Not the Alliance. Not Arthas, Medivh, or Azshara. Pretty much everything in WoW has to do with the Titans, Sargeras and the Old Gods. And so from the moment the expansion was announced, I knew that I would be returning to the game. The lore was too important to miss. It was early August, and I was paying attention again. This meant that the last two months since Legion's announcement have crept by ever so slowly as I awaited a reason to pull the trigger and reactivate my subscription. It came this past week, in the form of an armored drake. I had always told in-game friends that the fastest way to get me (and many others, I'd imagine) to return to WoW is to bring back the Armored Netherdrakes from PvP's past. 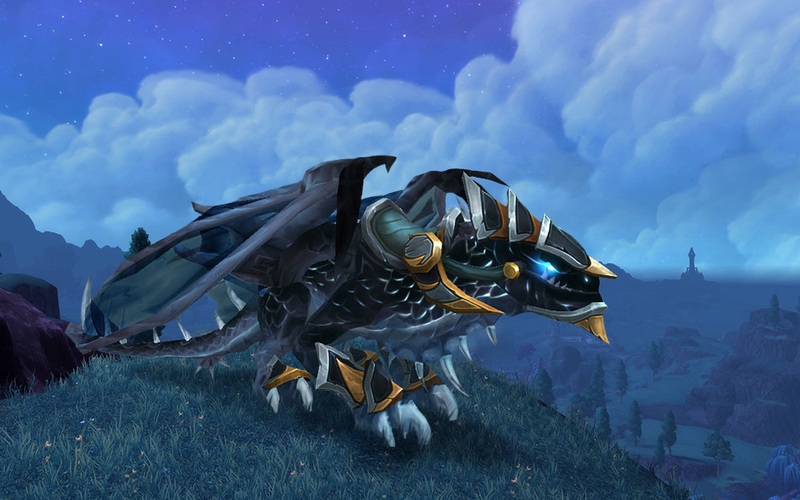 And while this isn't a Netherdrake, an Infinite Dragonflight mount just might be even better. And it's armored, too. Subscription, reactivated. Now to begin preparations to bag one of these beasts when they go live. I logged in this morning to find my Destruction warlock just as I had left him - in his Garrison. There were complete missions to collect, achievements that I received and information about some jungle zone that I should probably visit and the Hellfire Citadel raid. I didn't pay much attention to any of this information as it was brief and ultimately unhelpful. I also wasn't ready for that type of bread-crumbing as I first felt the need to reconnect with my avatar and online peers, since it had been so long. I focused on my Friends list and Guild Roster to see how everyone was doing and maybe to get some advice on what to do and where to go first. Opening up the Friends list, I found that no one was online. While two or three friends had been on earlier in the day, for most others it had been days, weeks and even months since their last login. I moved to the Guild Roster list to see who was online and it too was empty. Having a lot of experience playing Warcraft, I understood that Sunday mornings tend not to be the most active period of play. Still, logging into a Garrison and having no recognizable peer or human being to communicate with left my first Warcraft experience in seven months feeling incredibly empty. I logged out after 10 minutes of play. A feeling of emptiness among consumers is not something that any business or environment, real or unreal, can survive. Imagine yourself walking into a restaurant and having no one there to take your name. Or walking into an Apple Store and having no associate approach you or give you the time of day. Imagine going to your friend's house after being invited over, and no one answers the door. That feeling of loneliness, in of itself, may help to explain the drop in numbers WoW has recently experienced and is a major problem that Blizzard needs to address. Garrisons helped to create isolation issue as the game shifted from a "group" to "individual" model of play. Class Halls will look to address this in Legion by creating a more intentional environment where players can readily identify and communicate with one another. This will be a step in the right direction, but will it help? What about all of the other entry points in the game and WoW environment that lack the very intentional community that had been nurtured, built and created in years past? To ensure that players return to WoW, and stay with WoW for a meaningful amount of time, very specific attention needs to be provided to what I call the "Return Experience." The return experience is everything players interact with (in the context of WoW) the moment they resubscribe to the game from their account management page. From that moment forward, the relationship between the player and Blizzard is incredibly sensitive. Players anticipate their return with expectations that are often biased, impacted heavily by their most positive WoW experiences (the 40-man raid argument is a great example). When these expectations are not met, disappointment follows - and when you begin a relationship or "Return Experience" with disappointment, it is very difficult to recover. Another way to look at this is through the lens of "Relationship Recovery," which is another term for service recovery or how businesses treat a customer after something has gone wrong. When a player cancels their WoW subscription, it is fair to say that some level of dissatisfaction with the product exists somewhere in the player's experience. Relationship Recovery aims to identify this area of dissatisfaction, remedy it so that it does not occur for the player again and then aims to elevate the "Return Experience" so that the player feels the company appreciates his or her loyalty. In the World of Warcraft, this level of intentionality in the Return Experience is missing, even though it is key to WoW's continued success. This intention begins with a deep understanding of the player experience, something that Blizzard undoubtedly already has, but will need to re-evaluate in a meaningful way. There needs to be attention provided to maximizing what players experience when they anticipate logging in, what players experience when they enter their realm, what players experience when they engage content, what players experience when they exit the game, and finally, what brings players back upon reflection of their experience. This intentionality at every point of the game is paramount to success. For me, the Return Experience was disappointing, and in part, explains the exodus that WoW has experienced over the past year. But I have not lost hope. With intention, Blizzard can and will rebound and go back to the numbers that it once saw "back in the day." All it will take is that intent, and purposefully managing the experience of players, every moment at a time. My hope is that with Legion, they will do so.